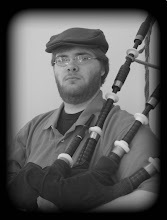 Seth played Dunbar P-3 pipes with Apps/Naill drone reeds and Dunbar Elite 1 model poly chanter with Soutar reed. I played David Booth drones (Dunbar P-2 stocks) with Selbie tenors, Apps/Naill bass and Kron Medallist ABW chanter with Soutar reed. My piobaireach gave me a feckle (I just started learning it 2 weeks prior), but I did get through it. I know, competitions are not the place to "practice", but no one else was competiting so it was a good opportunity to get some feedback from Patrick Regan (Patrick, I really enjoyed our piobaireachd discussion!). Ed Krintz judged the march events and gave me an excellent sheet with pointers to improve even further. I goofed the 4th part of my 6/8. The 2/4 went better and I received a "above grade level" (agl). Overall, solos went great then it poured. If you weren't wet yet from the constant drizzle and humidity, you were now!